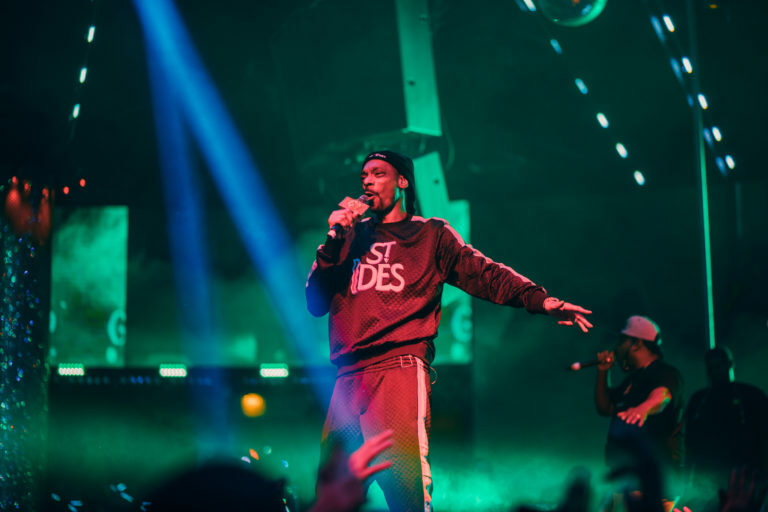 With the big Fight Weekend taking place here in Las Vegas, Drai’s Nightclub was the place to be and be seen on the Strip worthy of a stacked lineup featuring Nelly (1/18), Migos (1/19) and Fabolous (1/20). A number of special guests were spotted including Tito Ortiz, Micheal Blackson, Chris Tucker, Wiz Khalifa, NFL players Dak Prescott, Marquis Lee, Carlos Hyde, Ezekiel Elliot, and many more receiving bottle service in Las Vegas! This time we had fan-favorite Nelly coming back to one of the top nightclubs in Vegas with another high-octane set to start the weekend. Special guest and comedian Michael Blackson came up to say hi to everyone and joined the Drai’s Dirty Dancers on stage to warm us up, followed by Nelly getting it going with “E.I.” as fans screamed in excitement – “Las Vegas, what’s happening?! First off I wanna thank Drai’s for having me, I wanna thank y’all for coming out and seeing me; I appreciate every one of y’all! Who’s been riding with Nelly since day 1? !” We had plenty of day 1 fans showing love that night as they sang along to classics “Ride Wit Me,” “Air Force Ones,” “Dilemma,” all the way up to his most recent hit “All Work No Play.” Nelly was all smiles and his love of being on stage is still unmatched, greeting and shaking fans’ hands on the dancefloor at every chance alongside the St. Lunatics amping the crowd up! “Shout out to the West Coast in the building! Shout out to St. Louis, Michael Blackson, my DJ Deja Blu!” Closing it out with “Hot in Herre” and “Just a Dream,” Nelly happily stuck around afterwards to keep the vibes going all night long. Saturday was the grand return of Migos at one of Las Vegas best nightclubs, and it was the place to be after the big fight. Electricity was in the air from start to finish, with their official DJ Durel getting partygoers warmed up for their full-length performance. “Yessir, what’s up Las Vegas? If you from out of town make some noise! If you been with us since day 1 make some noise!” Quavo asked the sold out crowd as they started it off with “Biggest Alley Oop,” “Hannah Montana” and “Slippery.” There were cheers left and right with tables making it rain, bottles popping, celebrations of all kinds – you had to be there to really know! This time we had each member perform their individual singles as well, with Quavo Huncho bringing out “Workin Me,” Takeoff coming in with “Casper,” and of course Offset’s verse for the smash hit “ZEZE.” “If you having a good time, lemme get a ‘whoo’!” Migos ended their show with “T-Shirt” and “Stir Fry” to an epic finale filled with smoke and confetti as fans continued to party the night away. The weekend momentum continued Sunday night for another special edition of #SunDraisWithDJFranzen, with Fabolous live in concert! DJ Franzen warmed the jam-packed crowd up playing the hottest hip-hop and R&B tracks, as well as handing out some complimentary shots for all the birthday girls on the dancefloor. “Vegas it’s 2019, if you in this motherf***** make some noise!” Fab began with “Ball Drop” and “She Wildin,” backed by his charismatic DJ Boof getting everybody turned up all night. Performing banger after banger, he took a moment to bring out special guest Lil’ Mo on stage to assist with a few tracks! The legendary songstress sang to “Superwoman,” “U & Me” and “Can’t Let You Go” as fans applauded and happily sang along to the memorable hits – “Give it up one time for my sister Lil’ Mo!” Fabolous closed his show out with “Throw It in the Bag” to 2010 “You Be Killin Em” to round out the big Fight Weekend!